My daughter told me the last time I re-blogged from Gaia Portal, even with my comments, that she didn’t get anything out of it. I have attempted to only blog what I thought was mostly understandable and people would think important. I appreciate when people let me know what they don’t like. Well, I think I can explain most of this. See my orange comments. Add your comments if you disagree. I think it is the longstanding negative situations, ideas, lies, entities, etc. I’m not sure about “attachment points”, except I take it that we are released, by energetic clearings the planet has undergone, from attachment to them. Do you find yourself now free of most negative thoughts and reactions? Free of media lies? Falsities in religion? Consider what other things you are free of. We are living in the NOW now, focusing on the moment, not mulling over the past and worrying about the future. How many appointments have you forgotten during the past six months? I don’t know if they are talking about people or timeline trajectories of events, or both. People who don’t live in the now. Events, situations, plans that are based on experiences and assumptions from the past. It’s a New Age now. We have new perspective. A re-statement of earlier lines. We now BE in the present. Just BEing. Time is discontinuous. BEing is discontinuous. We cut ourselves from the past and live and BE in the everpresent NOW. As Dolores was told by the Subconsciouses (Higher Selves), it’s not happening, it’s all just existing. If you look at life, future lives, past lives and parallel lives like that, as existing now, so that there is no past or future, but only what our consciousness focuses on, we know that we can choose any set of Multiverse pebbles to experience (see Imagine How We Can Operate in the Multiverse ). In short, we, freed of negative beliefs, freed of the past, can choose our reality, our personal universe, in real time. The same can be said of collective experiences and timelines. Entities that continue in trajectories based on the past, or maybe they mean entities that hold us to the past, are gone. 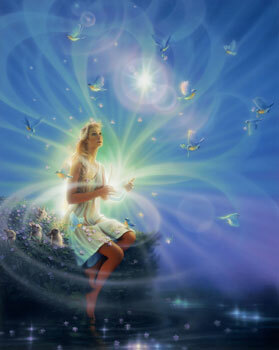 Right NOW, Earth is prepared for a finalization of this process of Transformation to New Earth! No more negativity. Increasing 5D abilities. Maybe all that remains is The Event we’ve talked about here on the New Earth Blog. BTW, I’ve been listening to Andrew Bartzis on Galactic History on YouTube. He said The Event would be a moment of shared dreamtime. Decide for yourself what you think.